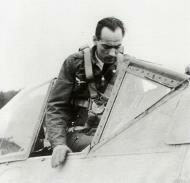 Willi Reschke claimed his victory over the Tempest of 486th Sq. Lt. Mitchel by his own words in a "White 1" Ta 152 H not in the "Green 9" in wich he surrendered to Allies later. Some undoubtfull sources even mention "Yellow 1" as the plane to be. At the Stabschwarm in JG 301 it was usual that even normal pilots not attached to Geschwaderstab flew those nasty Ta 152's on training missions or even in combat sorties. It is therefore very hard to consider one plane as a personal plane, as they were frequently shared by those lucky guys. Black "13" doesn't exist in my list, as on the original source photographs it's clearly non "13" or propable "13" and in Reschke's personal Biography it is also mentioned definitly as Black "3". And who else should know it better, than the guy who personally flew it. III./JG 301 was selected to be re-equipped with the new Ta 152. Because of production delays this goal could not be achieved. It was decided to concentrate the new machines into the Geschwaderstab and transfer experienced pilots from III. Gruppe to the Stab. Oberstleutnant Fritz Auffhammer was the official Kommodore but was mainly an administrator. From III. Gruppe came Willi Reschke, Hermann Stahl, Josef Keil, Sepp Sattler, Christoph Blum and Heinz Gossow and from JG 300 came Walter Loos. Ta 152 H-1s saw very limited service at war's end, with the Geschwaderstab and III. Gruppe of J.G. 301. To demonstrate how limited the type's service was, on 11. April 1945, the Stab J.G. 301 had just seven Ta 152s (three serviceable), and III./J.G. 301 had six (three serviceable), all in ne 6 serviceable aircrafts. Due to mysterious gremlins affecting the durability and other reasons, a bunch of the Ta-152 H's were complete losses, while on sortie or training. Here is a Ta-152H-1 of Stab/JG301, W.Nr. 150168, April 1945. RLM 81/82/77+04,23,25and Ta-152H-0 flown by ofw. Josef Keil, Stab/JG301, April 1945. I made a bunch of Ta 152 Hs attached to JG 301 wich actually saw real combat. Refferring to literature & interviews published by JG 301 Members these are the concrete ones to be mentioned after their numbering, as well those documented in photographs. i.e. Willi Reschke claimed his victory over the Tempest of 486th Sq. Lt. Mitchel by his own words in a "White 1" Ta 152 H not in the "Green 9" in wich he surrendered to Allies later. Some undoubtfull sources even mention "Yellow 1" as the plane to be. At the Stabschwarm in JG 301 it was usual that even normal pilots not attached to Geschwaderstab flew those nasty Ta 152's on training missions or even in combat sorties. It is therefore very hard to consider one plane as a personal plane, as they were frequently shared by those lucky guys. Black "13" doesn't exist in my list, as on the original source photographs it's clearly non "13" or propable "13" and in Reschke's personal Biography it is also mentioned definitly as Black "3". And who else should know it better, than the guy who personally flew it. III./JG 301 was selected to be re-equipped with the new Ta 152. Because of production delays this goal could not be achieved. It was decided to concentrate the new machines into the Geschwaderstab and transfer experienced pilots from III. Gruppe to the Stab. Oberstleutnant Fritz Auffhammer was the official Kommodore but was mainly an administrator. From III. Gruppe came Willi Reschke, Hermann Stahl, Josef Keil, Sepp Sattler, Christoph Blum and Heinz Gossow and from JG 300 came Walter Loos. Ta 152 H-1s saw very limited service at war's end, with the Geschwaderstab and III. 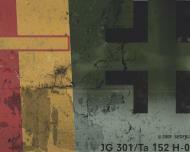 Gruppe of J.G. 301. To demonstrate how limited the type's service was, on 11. April 1945, the Stab J.G. 301 had just seven Ta 152s (three serviceable), and III./J.G. 301 had six (three serviceable), all in ne 6 serviceable aircrafts. Due to mysterious gremlins affecting the durability and other reasons, a bunch of the Ta-152 H's were complete losses, while on sortie or training.